Hans Friedrich Blunck came from a peasant background. He was educated at the Universities of Kiel and Hamburg. In 1925 he became legal advisor to the University of Hamburg. His wrote fairy tales and novels about old German themes. His Führer novels were about Hein Hoyer, a fifteenth century person who became a national leader. They were popular during the Third Reich and in 1933 the nazis offered him the position of President of the Reich Chamber of Literature. In 1935 he was replaced by Johst. Blunck wasn't a member of the NSDAP and he spoke against persecution of Jews who had served Germany during the First World War. However, in 1936 Blunck he founded the Stiftung Deutsches Auslandswerk ("Foundation of German Works Abroad") that was meant to paint a positive picture of the German Reich abroad. After the war he declared that he had never been a nazi, but in his memoirs "Unwegsame Zeiten" (1952) he was completely uncritical of the nazi era. 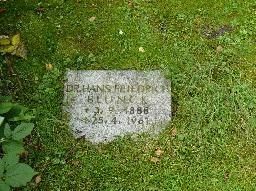 The grave of Hans Friedrich Blunck at the Ohlsdorfer Friedhof, Hamburg.